America’s trade deficit deepened in October, reflecting the global economic slowdown. Exports dropped by 3.6%, the most in nearly four years, the Bureau of Economic Analysis reported. Imports fell 2.1%, suggesting weak U.S. consumer demand. Wholesale inventories grew more than forecast while sales declined in October, according to the Commerce Department. The critical inventories-to-sales ratio rose to its highest point in three years, suggesting less urgency for businesses to increase production or add workers. A dip in energy costs, including a four-year record drop in gasoline prices sent the Producer Price Index lower in November. The Bureau of Labor Statistics reported a monthly rise in food costs, but on balance inflation on the wholesale level decreased for the month and stayed just over 2% on a year-to-year basis. The Labor Department said the moving four-week average for initial unemployment claims fell for the first time in six weeks. As jobless filings recover from the disruption of Hurricane Sandy and seasonal layoffs tied to Thanksgiving and outdoor working conditions, the average dropped by 6.6%, the most in 45 years of data. Claims levels returned to below the 400,000 mark for the first time in three weeks. With consumer spending accounting for 70% of the Gross Domestic Product, a nudge up in retail spending in November suggested continued momentum for U.S. economic growth. Spending on cars rose, gasoline sales declined, and 10 of 13 retail categories gained since October, according to the Commerce Department. Although growth has been choppy and mild, retail sales have recovered from the recession to reach record levels. Separately, Commerce reported that retailers, wholesalers and manufacturers together added 0.4% to inventories in October, the least in four months. But their sales fell for the third month in a row, meaning supply has been running ahead of demand. Inflation at the consumer level stayed below the Federal Reserve’s preferred annual rate of 2% in November, according to the Bureau of Labor Statistics. 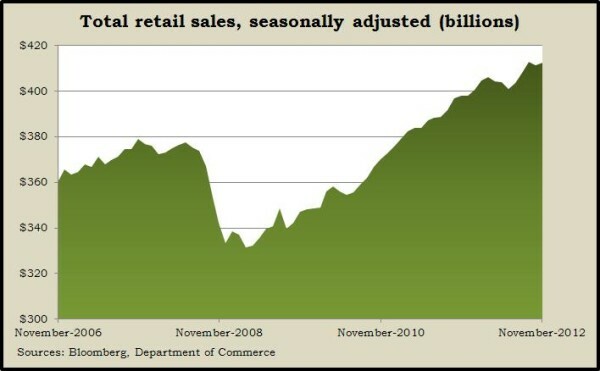 The Consumer Price Index rose 1.9% from November 2011, excluding volatile food and energy prices. The rate dipped to 1.8% including food and energy, in part because fuel costs rose just 0.3% in the last year, including a 7.4% dip in gasoline prices in November. The Fed credited a rebound from Hurricane Sandy for a higher-than-expected rise in industrial production and capacity utilization in November. Led by a boost in manufacturing and particularly motor vehicles, production rose the most in nearly two years. Production use reached its highest point since July but remains below the long-term average as growth in the global economy has slowed.